Stormy Hull once hoped he would one day sell a horse for $50,000. At the Oct. 17 Barretts October fall mixed sale in Pomona, Calif., Hull topped the sale with a $220,000 yearling filly he hauled to Southern California from Washington state himself. “It’s beyond my dreams—it’s surreal,” Hull said. The filly, named Smiling Diamonds, has plenty of pedigree. Consigned as Hip 94 from Hull and Ginger Samples’ Critter Creek Farm, she is out of Hull’s stakes-placed Slewdledo mare Carrie’s a Jewel, who is already the dam of California Diamond, champion California-bred 2-year-old male of 2016. The sale topper is by Smiling Tiger, California’s leading first-crop sire. Steve Gasparrelli, who already has promising Smiling Tiger runners in his arsenal, bought the sale topper. Advised by his trainer, Mike Puype, Gasparrelli bought the filly in the name of his Slugo Racing. Gasparrelli bought last year’s sale topper, a $190,000 son of Smiling Tiger-Erica’s Smile, by Williamstown. A total of 128 yearlings grossed $2,155,000 and averaged $16,836, with a median of $5,500, compared to 2016, when 136 yearlings grossed $2,132,500 and averaged $15,680, with a median of $8,750. The yearling buy-back rate was 35%, with 68 of the 196 through the ring not sold. Overall, 155 grossed $2,301,000 and averaged $14,845, compared to last year’s figures of 175 grossing $2,496,500 and averaging $14,266. Gasparrelli, who said he has about 20 horses in training, all with Puype, led all buyers at the sale. He purchased two for a total of $305,000. In addition to the sale topper, he went to $85,000 for Hip 147, a California-bred daughter of Slew’s Tiznow-Grand Advice, by Mr. Greeley, a full sister to 2017 El Camino Real Derby (G3) winner Zakaroff. Adrian Gonzalez’s Checkmate Thoroughbreds consigned the filly. Hull was ecstatic after selling the Smiling Tiger sale topper. He bought Carrie’s a Jewel for $5,000 and raises all of her foals himself in Sequim, Wash., after they foal in California. He said he ponied the Smiling Tiger filly himself to get her fit for the sale. Two other horses brought six figures at the sale, including a California-bred daughter of Acclamation-Ismene, by Tribal Rule. 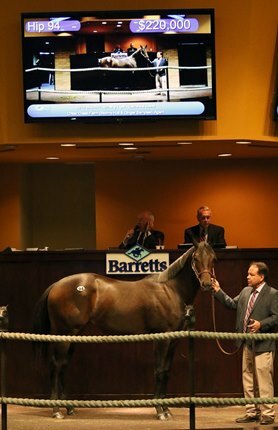 Consigned by John Harris’ Harris Farms as agent for Stephen Ferraro, the filly sold for $160,000. Trainer Terry Knight signed the ticket for Pete and Evelyn Parrella’s Legacy Ranch.